peace be with you on this holy night. Why do we gather? What is this night? to love each other as he loved them. This night is joyous, fierce, tender, terrible. We begin in light, with memories and stories, friends and feasting. We end in shadows, with a queasy fright. We begin as the friends of Jesus did long ago: together, as one. We end as they did: scattered in the dark. We begin as they did: singing of love and deliverance. We end as they did: without a single sound. Friends, be at peace on this holy night. Enter it with open hearts. look with pleasure on your people who gather here. we may receive in abundance the blessings of this night. your will, not ours, may be done. Glory to you, yesterday, today, and forever. Remembering God’s deliverance: Observing the feast of Passover. the people of your heart remember. At table they tell the story and they sing your praise. and we praise your faithful love. and set us on a pilgrimage of peace. The mark of the new community is love and service. and whose service extended even to the washing of feet. and shared with all the world. In remembrance of him we pray. Amen. before you come to the table with gifts, make peace. Then bring your gifts, then bring your lives. Dear friends, let us make peace in our hearts. that keep us from loving each other and our God. You may remain seated for the song. laid down his life for us. through Jesus Christ, good brother and friend. and we offer each other a sign of his peace. friends of Jesus, who is our peace. Beloved, let us celebrate with Jesus at the table of peace. For he loved his own, even to the end. Let us eat the Feast with him. For now nothing can separate us from his love. For he laid down his life for us all. Praise to you, God of glory! Your love created the universe and sustains it. You breathed life into our dust and placed us in paradise. You found us when we hid ourselves, ashamed of our sin. in an alliance that lasts forever. through the tender ministry of Jesus. and healed us with his human hands. and suffered for his faithfulness on the cross of shame. But you loved him faithfully, raising him from the dead. forever we belong in your household of joy. Holy and wonderful God, all your creatures testify to your love. Now, O God, we remember Jesus. We remember that he longed to celebrate the Passover with his friends. He arranged for a meal, his last in this life. He knelt before them and washed their feet. We remember that his betrayer was with him. Jesus loved and served him too. from the oppression of Pharaoh. and drank the cup of blessing. gave thanks to you, and broke it. “This is the cup of a new covenant in my blood. Holy Spirit, come make all things new. Bless this bread and cup, and us who share them. May they be for us life-giving food and drink. and every creature beholds it. The gifts of God for all God’s people! Let us rise and give thanks. and for the mission of justice you have made our own. the will to serve you every day, and life that never ends. 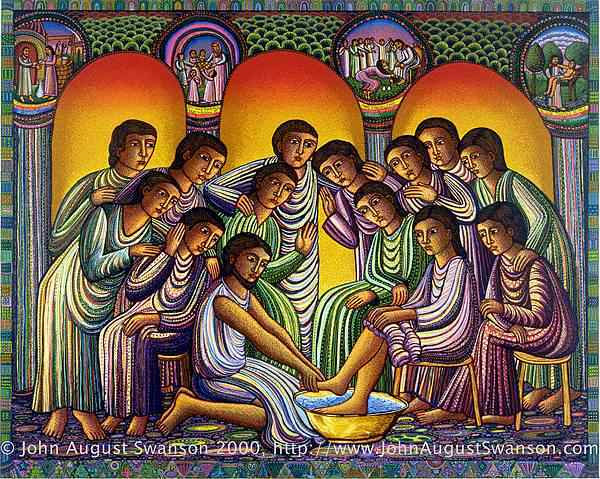 Footwashing may be done in a symbolic way, e. g., one member of the congregation or the pastor washes another person’s feet in a stylized, mime-like ritual, center chancel. If this option is used, opportunity for others to wash and be washed might be provided before or after the liturgy, perhaps during an pre-service agape meal or love feast, or after the service in a chapel or fellowship hall set aside for this purpose. Footwashing of more than one person or a small group of representative disciples may also be done in the service itself: there may be a general invitation to wash one another’s feet at stations set up around the sanctuary, or the deacons of the church may be sent to stations to wash the feet of those who wish to participate. The congregation needs to be prepared for a slightly longer overall service. If footwashing of all who wish to take part is the choice, quiet music or appropriate hymn-singing should accompany the ritual. This entry was posted in Lent and Holy Week, Liturgy on March 13, 2013 by sicutlocutusest.